Want a pre-owned ride? Our used vehicle inventory will exceed your expectations. Financing programs we offer are bar-none. Apply today and review your options. Need any servicing on your vehicle? Feel free to schedule an appointment today! 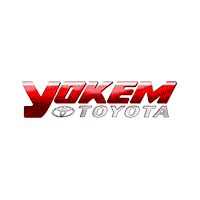 Yokem Toyota is a premier new and used Toyota dealership in Louisiana, serving Bossier City, and is here to meet each of your automotive needs by providing friendly service, precise attention to detail and, of course, a superb selection. So whether you’re in the market for a new 2017 – 2018 Toyota model, a used car, a replacement part or you just need a quick oil change, be sure to make our Shreveport, Louisiana dealership your first and only stop. It’s easy to jump to the conclusion that shopping for a new Toyota Tundra, Camry, Highlander, 4Runner, C-HR, or Corolla can be strenuous, but it doesn’t have to be. At Yokem Toyota our friendly professionals are available to ensure that all your questions are answered while giving you the opportunity to peruse the Toyota at your liberty. When a vehicle’s caught your eye, simply catch our attention; we’re happy to schedule a test drive at your convenience. Click here for directions to visit us in person, or give us a call at (888) 602-7654 with any questions! With the professionally-trained technicians in our car body shop in Shreveport just an appointment away, you’ll get in and get the assistance you deserve quickly, easily, and affordably.